Get involved and get in touch. Join us on YU Connect! Have a question, comment or concern? Fill out a form here. This is your opportunity to share your thoughts on or inquire about academic-related and SCOLAPS issues. 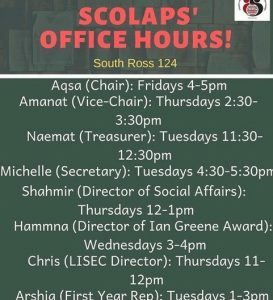 Come visit us during our office hours!